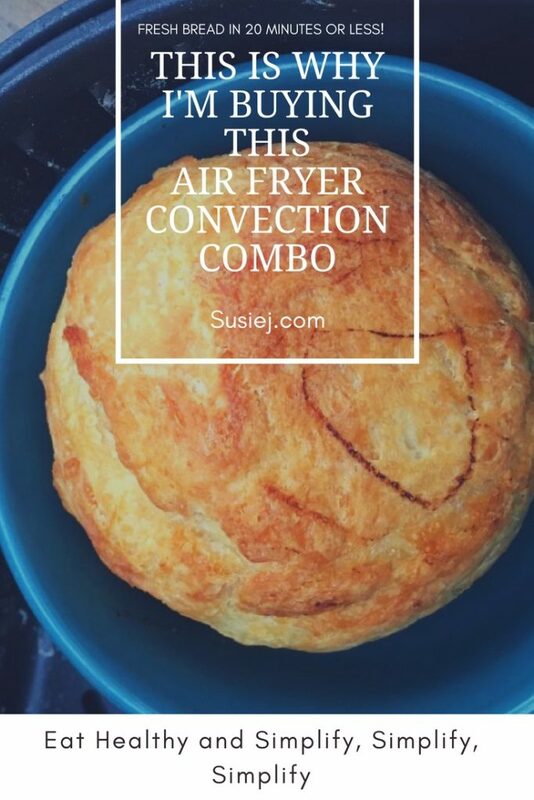 OK — I know this is not technically an Air Fryer… but bear with me — it works like one. I picked up this Bella Air Fryer on sale, as a whim — and I ended up loving it so much that I use it more than my microwave. I use it to re-heat leftovers so that they are hot and crispy and juicy, and not mushy like the microwave leaves them. The steaks cook up moist and juicy — same for seafood. I even make gorgeous mini loaves of bread. One of my hacks is to put an oven-safe bowl in the tray, well oiled, to use to cook the bread, and re-heat leftovers. It eliminates the mess inside of the fryer — although the entire Air Fryer tray can be thrown in the dishwasher. The bowl makes it easier if you’re going to be using the fryer for several things throughout the day, and you don’t want to wash the tray everytime. Just put the bowl in the dishwasher and you’re done. So, what I’ve learned from my 7 months with an Air Fryer, is that it’s versatile. It’s fast. And food somehow tastes amazing. French fries and other frozen foods are a given — fry them up with minimal oil, and they taste amazing. But it needs improvement. The little tray is hard to deal with — and I think the Air Fryer is still in the “evolving phase. ” It’s just not quite there yet. But I’m going to keep using it until it knocks out. So, my son, away at college, would love to have the convenience of cooking a three-course meal quickly, so I thought I might give him one. Except — not. I wanted him to have some new gadget — like the Instapot, that allows him to cook fast, quick and easy meals. But an Instapot is not an AirFryer. He can’t cook a pizza, cookies, or even chicken nuggets — and you can’t see what’s happening in there. First of all, he’ll be able to see everything as it’s cooking. Guys like to grill because they can watch what’s happening as the fire turns the food into a meal. I’m just kidding about this — but I think there’s something to the “visual” aspect of the food and guys. Second, with the racks, he can air fry his french fries, while he’s cooking the meat. Check out this tutorial to see what I mean. Third, it’s fast. Apparently, frozen food cooks best — which is great for him, because he’s not thinking about what he’s going to have for dinner the next day. He will not pull out a chicken breast out of the freezer the night before. Fourth, it’s glass. No BPAs. Fifth, the bowl is on the bottom — and you can simply add a cushion of aluminum foil on the bottom to nest all of the juices as they run down the bowl. Easy cleanup. Sixth, It’s under $50. Lovely. Eighth, he can cook a sweet potato in record time. Ninth, maybe he will let me borrow it before he heads back to school.